Easter Sunday morning in Central Park, and everywhere it looks like love. All kinds of love. Puppy love, romantic love, spiritual love, birds-do-it-bees-do-it love, love of mankind, love of life. Not a grumpy being on the grounds as far as my eye could see...at least at 8 a.m.
And this was before going to church! Inevitably any stroll around Manhattan will conjure up comparisons to Paris - the art and architecture, the parks, the people, the culture. In Central Park I find many of these comparisons converge. 1. People and their dogs. It is said that Paris is dog heaven. But, honestly? My vote goes to New York. Apparently there is a law (or a loophole) that allows dog owners to let well-behaved pooches off-leash in the early morning hours in certain areas of Central Park. And so they come in droves. Everything from teacup terriers to Great Danes, frolicking in one happy love-fest, rolling and sniffing and delighting in each other's company, with their loving owners gazing contentedly as their beloved canines do what canines do best. And the camaraderie among the owners is on a different plane from normal Manhattan sidewalk protocol. They like each other and each other's pets, greet them with genuine affection, saying, "Max, sweetheart! Go over and see my Sophie! She has a stick!" So endearing, so full of love and friendship. Okay, I admit that I got a bit unnerved hearing a man shout, "Polly, stop that!" only to turn around and realize that he was talking to his border collie. Another more...ardent love that I witnessed was a man on a bench in a semi-icky full frontal embrace with the standard poodle on his lap. But each to his own, I guess. I will not begin to get involved in much depth in the pooper-scooper stories and comaprisons. Let me just say that in Paris, since almost no one picks up after their Fidos, I always walk with a careful glance to the sidewalk. In all my time in Paris, never a squish. Seriously! In New York, however, since you expect the sidewalks to be clean, you maybe don't pay as much attention underfoot, and --bingo!-- squish on the soles of your Italian ballerina flats on the way to church. For example. 2. For the beauty of the earth. Urban environments can be cold and hard and structured and unyielding. Yet, a few steps into the park, and the city quickly melts away. This is a beauty of Paris, too, with its many parks, pocket gardens and refreshing squares. Today, in the Park, Spring was showing her greatest triumph over winter. And the joy of rebirth after a long and dismal period of dim and dying. (And, alas, there are many spots where the loss of huge trees during Hurricane Sandy is painfully evident.) But also so many defiant delicate petals of sheer exuberance: "Yes, there will be spring." Is there a heart that isn't uplifted by the sight of new spring flowers? Harbingers of hope, of renewal and new things to come. 3. For the splendor of the skies. New York streets are veritable urban canyons, impressive yet sometimes daunting in their sheer pressure and overwhelming concrete-and-stone power and glory. It is refreshing to get into open space where you can see the architectural structures from a distance. When you are swallowed up by the buildings and the built environment, it is not as easy to appreciate them. From the middle of the park, it is a moment of awe. Especially contrasted against the Park's Belvedere Castle, in wide-open sky. 4. Shakespeare in love. The Shakespeare garden. Shall I compare it to a springtime day? A yard for the Bard, a favorite spot in the Park. When you see this fence, you know you're in Shakespeare country. Please let me know if you know of a fence more poetic, more romantic than this. It reminds me in some ways of the small grotto-like pocket park just below the Trocadero in Paris. The Shakespeare in the Park Delacorte Theater is in the background in this photo. You can draw your own comparisons (or not) to the drama of daily life at the Trocadero. 5. Let's fall in love: avian chapter. Yesterday morning on the pond, two mallard drakes were loudly squawking, jabbing, and nipping at each other -- a real macho splashing squabble -- as the female duck paddled demurely on the sidelines. Clearly she was the object of their desires for the upcoming love season, and only one of them was going to win. A love contest! This is no minor tale. Yesterday afternoon I ambled by again on a walk with Harry, and the two males were still sparring, drawing a bit of attention from the now-crowded group on onlookers. Ouch. A battle to the finish. One triumphant drake, one hen: the newly hitched mallard couple paddling around the pond, ready to be the star parents of Make Way for Ducklings 2013 NYC edition. Yes, and one loser in the alpha-battle for love, who apparently departed the territory. Another Sunday-morning New York City love story? Not limited to New York, of course. It reminded me of these two love-birds in Paris. Attached but showing slight indifference. Ah, love. Just ducky. 6. Harry Loves Sally. Or fill in the blanks. The trees offer an outlet for a supposedly permanent expression of love. Like a tattoo, but less personally accountable or embarrassing? Or not? I wonder if any of the couples are still together? And sometimes I think that the other, more ineffable expressions of love -- the greetings, the kisses, the pats, the hugs, the shared joy, the planting of exuberant perennial flowers for others to enjoy -- mean so much more than a moment's profession of heart-shaped love with a pen-knife on stolen tree bark. Labels: city life, looks like love, where am I? This illustration would indeed be a Spring chick, if the advertisement weren't 66 years old. Circa 1947. Since it's for an elastic company, however, let's just say it's a springy chick. The company: Société européenne de fils élastiques - 14.16 Bld. Poissonnière - Paris. 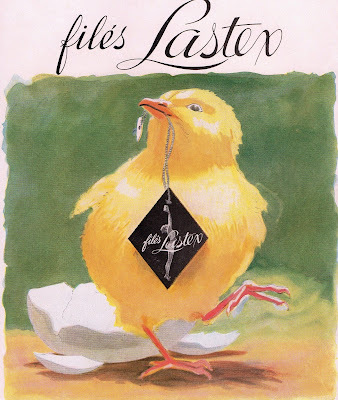 Alas, the European Company of Elastic Threads is no longer at that address in the 9th arrondissement. But you can see the building anyway on this real estate video on YouTube. Wishing all a joyous season. Do you know about this magical French oil? Second Avenue in New York City may not have the same panache as Madison Avenue, or even Lexington or Third, but it now forever holds a spot in my francophile heart. Striding down the sidewalk the other day, I caught a glimpse of something so totally French in a storefront window that I stopped in my tracks and entered. It was a hair salon, and they were selling Nuxe Huile Prodigeuse Or, a product I had never seen outside of France. It had been a staple in my batterie de maquillage in France. Tested chez des copines, forever enamoured of the little bottle of gold. A little on the cheekbones. A little on the hair. A little mixed in with the body lotion for that overall glow. My French friends all knew the subtle beauty secret. 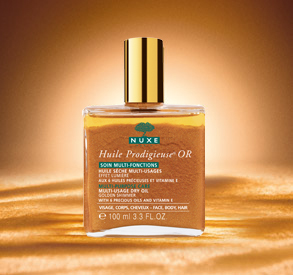 But.... how could I have presumed that Nuxe Huile Prodigieuse Or was not available in the U.S.? Silly me! This is New York. New York has everything. But the best part? I entered the salon, Marianne Vera, a beehive of activity, and headed straight for the Huile Prodigeuse in the window display. The owner approached me and didn't even attempt English. "Bonjour, je suis Marianne, je peux vous aider?" We started jabbering away in French, and I was happy to have a new acquaintance in the neighborhood who understood French beauty products (and maybe, eventually, my hair?). "But... but... how did you know to address me in French?" I asked, bewildered. "This never happened to me in France! Despite my efforts, I am always pegged as an American." "Simple," she replied. 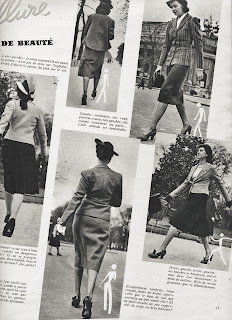 "Only Parisiennes see it in the store window and stop to buy the product. Les Americaines don't know what it is." Labels: beauty, shopping, where am I? Heading toward the subway station at Lex and 77th this early afternoon, I came upon large clusters of parade participants who had just finished marching 45 blocks up Fifth Avenue. Bagpipers, handsome NYFD in their dress uniforms, and -- wait, what's that I see? -- Bretonnes in their finest ancient finery! I was behind one woman for the two blocks until the subway entrance. All at once, though, it seemed that everyone around me was speaking French. Even the three giggling young American women flourishing empty Solo cups, wearing sparkly green deely-boppers, their faces painted with emerald shamrocks, were saying, "Yah, like it's 'Bonjooor and cawmontallay voo,' right?" Laughing and practicing their long-ago 7th-grade French lessons. About 10 paces ahead of me, the woman in ancient Bretonne dress, to my amusement, was chatting on her cell phone. I relish those anachronisms. Finally, at the top of the stairs to the subway, foot traffic was jammed, and so as we all waited I asked (in French) for the story -- it didn't matter who I asked because I was surrounded by French. But I found the perfect spokesperson, who even had a business card. a) there is a Breton Association here in New York, BZH New York. b) this organization brought 100 traditional Breton performers from Quimper to New York for the event. We do know, most of us, about the Celtic roots of Brittany, so it does seem so à propos for St. Patrick's Day. It wasn't the right time for me to wax enthusiastic about my love of Brittany, my first unforgettable visit to Guingamp in my college years and how more recently I almost -- almost -- bought a house there. But I look forward to getting to know the Bretons of New York a bit better. And then the most adorable part -- the three tipsy American girls group-hugged one of the French women they had gotten to know during the parade, saying, "Bye! Bye! We'll see ya in Paris!" Open Umbrella: Etiquette or Superstition? Sometimes there are those minuscule French/American cultural differences that pop up when you least expect them. Today was a torrentially rainy day in New York City. I arrived at work and immediately, as is the custom in our office, propped my umbrella wide open to dry it out, setting it in one of the few available corners of our unstructured office space by the conference table. I thought nothing of it. Mid morning, I had a meeting with a French colleague. We sat down and instantly I apologized for the now-dried umbrella crowding the floor of the conference room area, and hastily folded it up. "One of the big/small cultural differences I've noted between Paris and the U.S.," I remarked, "is that no one in Paris ever leaves their umbrella wide-open for quicker drying. There just isn't enough space. Cela ne se fait pas. [It is just not done.]" "Ben, oui," she replied, "Cela ne se fait pas. But it's not a matter of space, though, Polly: it's a question of superstition." What do you think? Do you leave your umbrella to dry open, or closed? Don't laugh. These things matter. Labels: French traditions, made me laugh, where am I? It's a challenge, some times, to keep up with all the latest digital connection places. Back when I was a digital neophyte in 2006 and started this blog, the world of bloggers was a small one and often under siege by the mainstream media. But as a group we hung together, and no other group hung together better than the bloggers for the Paris Blog. And now, we old-world bloggers are SO thrilled that the mainstream media have joined our ranks. But -- wow -- how to keep up with all the new media? And, umm, I now have a day job. As technology and cool social media sites have proliferated, I've done my best to keep abreast of all the sites for communicating my message. This blog of course, has a Facebook page, and if you haven't yet liked it, I encourage your participation. I am also on Tumblr (for which I have a kind of visceral aesthetic love), and Twitter, which I attend to in fits and starts. I am even on etsy and ebay, should I ever find the time to sell some of my French trouvailles. Working on it! But when I joined Pinterest, I was irked, annoyed, upset to see that someone had taken my name, "Polly-Vous Francais," to use for one of her Pinterest pages. 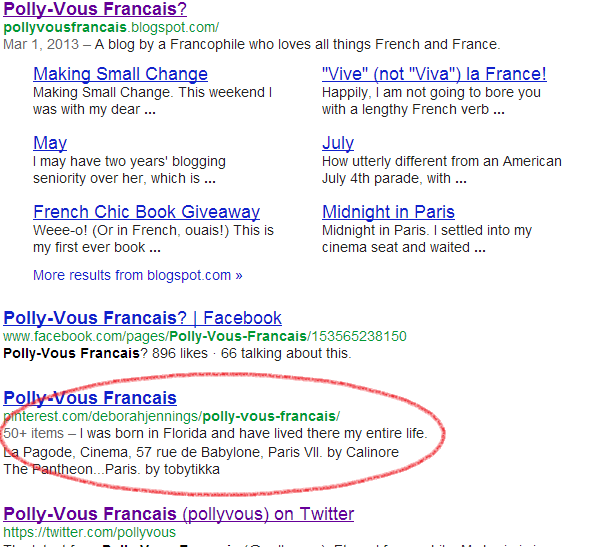 Awkwardly, I do also have my own, authentic, Polly-Vous Francais Pinterest account. Why would anyone want to siphon credit, SEO, and Google page hits from my personal blog, which has spent six years delivering knowledgeable fun and news about Americans and their relationship with France? Especially since this other person who copied my copyrighted nom de plume is not named Polly in real life and has never even lived in France? 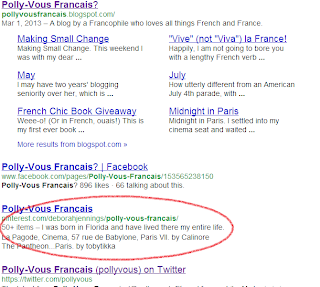 Polly-Vous Francais is my personal brand, built with pride and quality and a true raison d'etre. I've left a few comments on her page, asking for a name change. A few loyal fans have done the same. No response. Naturally, I'm not encouraging readers to flock to her page because that will only increase her page hits. Arrgh! But I wish that common courtesy still existed in the cyberworld. What do you think? Next steps? 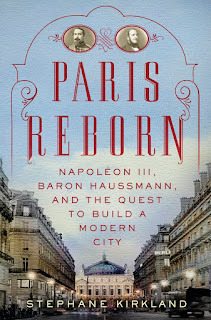 Those who know and love Paris, and think they know all about haussmannien architecture in Paris, will be delighted and informed at an unimagined higher level when they read the absolutely splendid new book by Stephane Kirkland, Paris Reborn: Napoleon III, Baron Haussmann, and the Quest to Build a Modern City. I am only three-quarters of the way through the book, which to me is a gripping narrative, a page-turner. If you love Paris as she exists today, you will simply devour each page. Stephane Kirkland takes his readers through beginnings of Paris modernization and through the city's massive transformation during the Second Empire. "Napoleon... had a large new slaughterhouse built on the edge of the city, with one important consequence: As of September 15, 1828, it became prohibited to drive cattle through the center of town." Or Queen Victoria's comments on her visit to Paris in 1855: "What could I say about this most wonderful city in the world?" in an era when Paris was first learning what it meant to be a tourist destination. Or Baron Haussmann's disagreements with Hittorff. There are far too many excellent chapters in the life of 19th-century built Paris to enumerate here, so I simply recommend the book. Over and over. 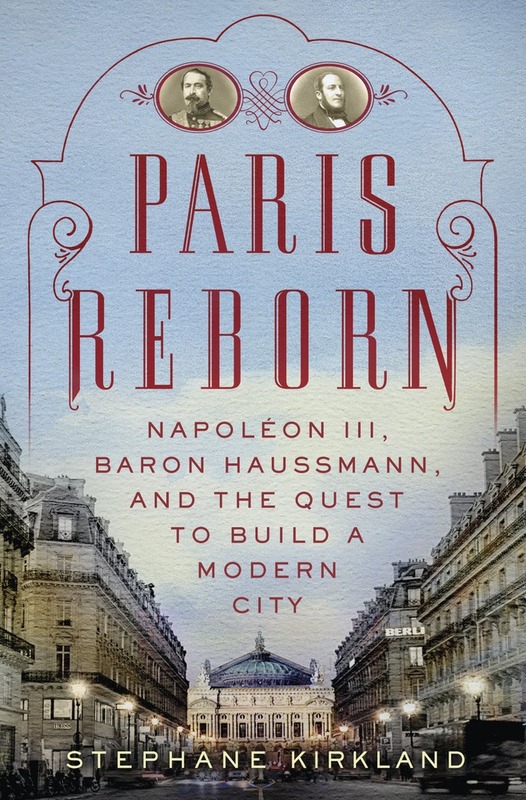 Kirkland captures the drama, both social and political, and opulence of Paris in the mid-nineteenth century, and begs the reader to ask what Paris would have become if Baron Haussmann had not persisted in his determination to carry out the expansive and visionary urban-planning ideals of Napoleon III. For those who love Paris today-- all the many millions of you -- this book is a must-read. You will always walk down the streets and grand boulevards of Paris henceforth with a knowing and appreciative understanding of how they got to be where they are today. Official publication date is April 2, but you might not want to wait that long to order it. Ask me! 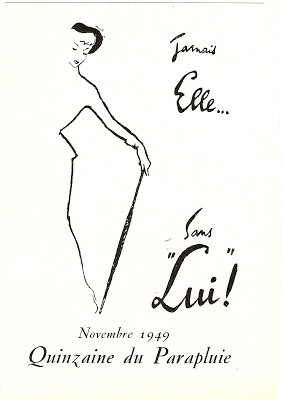 Ladies, have you always longed to acquire the allure of a chic Parisienne walking along the Place Vendôme or the Champs Élysées? Me too! I adore walking, and especially walking in Paris. The best exercise of all. Grace and physical allure are qualities that are more precious than the beauty of face or body. And did you know that nothing reveals more about the inner you? A physical bearing that is confident, free and easy, will never belong to a shy woman; and men simply are not drawn to a woman whose demeanor proclaims grumpiness. There are nevertheless exercises that can help you achieve that allure: practice walking with basket on your head, juggling, jumping rope, walking on tip-toe. Walk without hurrying. Relax, throw your shoulders back, plant the sole of the foot on the ground, and walking will be, even in the city, the most beneficial sport of all. 1. Certainly we have to open our stride from the hip, but, ladies, please: taking “giant steps” is not pretty. And bending the knees makes walking exhausting. 2. L’air perché – the heel touching the ground before the toe reaches the pavement. Non, non! And where is this pocketbook going, grasped in the fist like a dangerous projectile? And where is this doll going, arms and legs akimbo? Slow down! 3. Oh, dear. Drooping shoulders, hunched back, hollow chest, head bent over… this demoiselle glumly counts the cobble stones. This posture is just so sad. 4. Right-left, right-left, 2-3-4. Oh, no! The hips swing back and forth, taking the jacket with them in their movement. Nothing less gracious than this swaying. 5. Over-arched derrière, chest forward, arms going nowhere. Does this young woman hope that her nose will arrive before she does? The couture has certainly changed in the past 70 years... but does the posture advice still hold?